If you drive south from Beijing on the highways that cut across the North China Plain, some of the first things you notice are the invisible rivers. The road arcs upward above the cornfields and a sign insists you are crossing, “The Hancun River Bridge,” “The Liuli River Bridge,” “The Sha River Big Bridge,” or “The Especially Big Bridge” over the Qin River. But on most drives, this information functions mainly as history. Underneath the bridges there is nothing but more corn, or a pile of dust shifting in the breeze. Water supplies on the North China Plain, an area that is home to 200 million people and produces more than half of China’s grain, are among the scarcest per capita in the world. Centuries of damming and diversion for irrigation and flood control and recent decades of heavy industrial pollution have left the region parched on the surface and sinking deeper every year into the emptying aquifers beneath. China’s leaders are racing to replenish the region with water from other parts of the country, but in the meantime the wells get deeper with every passing year. 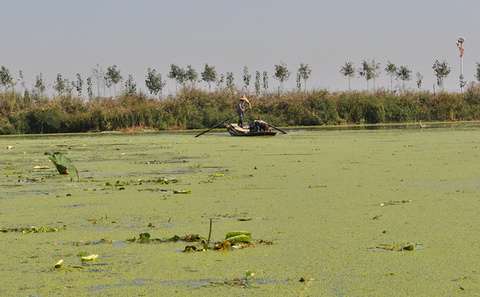 Perhaps nowhere do the threats to the region’s water supply appear more menacing than on Lake Baiyangdian, the massive wetland known as North China’s kidney. In living memory, the lake teamed with fish, flushed pollutants from rivers that passed through it, and regulated the region’s climate. Today, it is shrunken and poisoned, barely able to support the people and animals who live on its waters, let alone the country beyond. In “Staying Afloat: Life on a Disappearing Lake,” Chinese filmmakers Lynn Zhang and Shirley Han Ying train their camera on the people who have been both perpetrators and victims of Baiyangdian’s decline. They show us not just how its current predicament came to pass, but also the urgency of making sure Baiyangdian does not follow the region’s rivers into history. A version of this article first appeared on ChinaFile. Video produced by Lynn Zhang and Shirley Han Ying.